Bouncy castles are a great way for children to get some physical activity, but mental health in adults, especially students, is also very important. 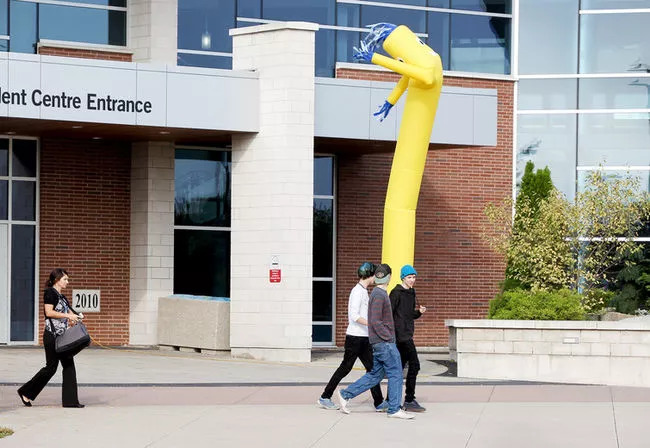 Our sky dancers were at Niagara College to help raise awareness of the issues of mental health as part of their Yellow Umbrella Project (YUP). The Niagara College Student Administrative Council (SAC) had one in front of each of their campuses in Niagara-on-the-Lake and Welland. Some students were perplexed as to why they were being given free ice cream according to this Niagara Falls Review article. Simple events like these with set pieces such as the appropriately coloured sky dancers, give institutions a platform for conversation about mental health or any other cause.